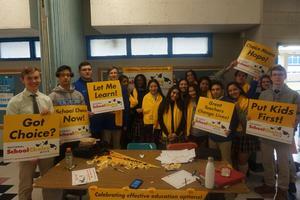 Dozens of Union Catholic students received yellow scarves during their lunch period on Wednesday for participating in the National School Choice Week program. Mrs. Jennifer Dixon, the Director of School Counseling at Union Catholic, handed out the scarves to each student after they wrote down why they chose to attend Union Catholic. National School Choice Week (NSCW) is held every January with the goal of shining a positive spotlight on the effective education options for children. To meet this goal, NSCW encourages schools, organizations, and individuals to hold celebratory events to raise public awareness of school choice options. UC junior Andrew Palacio, one of the many Union Catholic students who took part in Wednesday’s program, said Union Catholic was an easy choice for him.